It's a known fact that when Blizzard changes something within the game, there is an inherent risk that change breaks something else. This is a case in point. This is the first elevator you take when you go into Serpentshrine Caverns. I've started running this raid because I need the battle pet that drops off Lady Vashj, the end boss, for the Raiding with Leashes II achievement. The raid was the 4th one you ran during Burning Crusades and dropped tier 5 tokens and equivalent gear. This elevator and the one after this were notorious for claiming lives. You'd think you could make it and you'd jump, only to miss the elevator by 2 seconds and plummet to the bottom, a considerable distance, while your guild mates pointed and laughed. Battle pets were added to this raid during Mists of Pandaria but it was soloable once you hit level 80. With the arrival of Warlords of Draenor, Blizzard had to do an item squish because the sheer size of our health pool and the amount of damage we were doing was leaving astronomically large numbers on our screens. They went back to the old dungeons and raids and changed them to reflect that we are much, much stronger and the numbers we see on the screen are not the kind of damage we're doing. Along the way, some things, like this elevator, were broken. I know it doesn't look broken, but trust me on this. You're a level 100 and you want to get the battle pet so you take the elevator down. As it nears the bottom, to save time, you jump off. Wait...what just happened? You disconnect from the game. Logging back in, you discover you're in free fall from about the middle of the elevator shaft. Splat. Now comes the run back to Serpentshrine from the graveyard. If you'd waited until the elevator had reached the bottom before running off it, you would not have used up all the time you thought you would save plus whatever else it takes to find your corpse. I thought it was me, just me, and then it happened to another guild member; the exact same thing at the exact same location. I put in a ticket, but this is not something that is high on the list of things to fix. 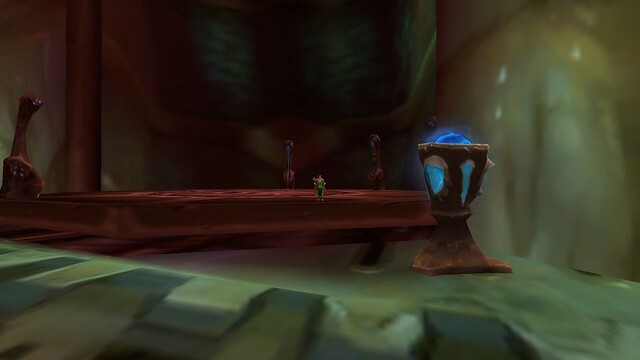 If you're running Serpentshrine for the battle pet, do yourself a favor and wait for the elevator to get all the way to the bottom. That corpse run can be frustrating.